When I was younger, so much younger than today, I thought that the classic dish of peas, panir cheese and tomatoes was called Mata Panir. You probably know that mata is Hindi for mother, and panir refers to traditional fresh cheese. I used to nickname the dish ‘the old cheese’, a reference to English slang for one’s wife. Anyway, I’ve been meaning to share that piece of trivia with someone for a while. In reality, of course, the dish is called Matar Panir, matar meaning peas. “How to make mutter panir?”. Mutter is in fact how the word matar is pronounced. This dish originates in Punjab, northern India. However, it is well known all over India, and there are hundreds of variations of the same dish. 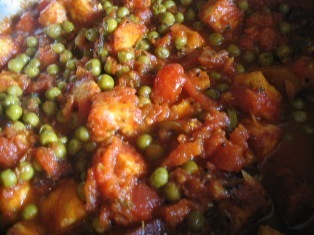 But the same main ingredients are always there: peas and panir cheese in a spiced, minted tomato sauce. Here’s a delicious version that can be served with any meal, anytime. It especially lends itself to special feasts and dinners and can be kept warm for some time, actually improving the flavour of the dish. Serves 5 or 6. Heat 2 tablespoons ghee or oil in a 5-litre/quart saucepan over moderate heat. Saute the mustard seeds until they crackle. Add the cumin seeds and stir until they darken a few shades. Add the ginger and green chilies and saute momentarily. Add the chopped tomatoes, powdered spices, sugar, and half the herbs. Partially cover and, stirring occasionally, simmer for about 15 minutes or until the tomatoes break down and turn pulpy. Heat the ghee or oil in a pan or wok over moderately high heat. When hot (185°C/365°F), deep-fry the cubes of panir cheese a batch at a time until golden brown. Remove and drain. Add the peas and water or whey to the tomato and spice mixture. Boil, reduce to a simmer, and cook uncovered for 5 minutes. Add the tomato paste and salt and mix well; then add the panir cubes and simmer for 5 more minutes. Before serving, add the remaining herbs. Serve hot.